Grenache speaks of warm places. This a grape that loves the sun. It likes things to be warm and dry, so it tends to be made in places one would just as happily go on vacation. Likewise, there is a generousness and inviting quality to the flavor of these wines. They draw you in like a welcoming host. It can sometimes get a bad wrap. If not handled properly, it can make wines that are really blah, and there’s a lot of that out there. (In a way, it has this in common with Zinfandel.) It has a tendency towards high levels of sugar and thus alcohol. It also tends to have only moderate tannins, and it’s acidity levels can quickly take dive in the heat. It needs to be grown carefully to keep the structure in line so it doesn’t get lazy and flabby. Grapes have to be picked at an ideal point where they’ve reached physiological ripeness, but when the acidity has not yet been chased away. Slopes and hillsides can help with this, since cooler temps help keep that acidity in place. Restricting yields also help to keep quality levels high. Blending it with other grapes that fill in the structure gaps is another popular way to work with this grape. Syrah and Mourvèdre are probably it’s most blending partners. This combo is so common it gets the acronym GSM. From Spain, it continued to travel. You’ll find it all around the Mediterranean, particularly in the south of France, most notably in the Southern Rhône like we saw with last week’s Gigondas. It’s hard to argue with a grape that makes up the base of so many fantastic Châteauneuf-du-Papes! There are also some really great examples from the US and Australia. It takes different expressions of course wherever it is grown, but it usually tends more towards red fruit notes–strawberries and raspberries, often with light dustiness that reminds you of the warm dry places it came from. There's usually a spiciness to it and leathery notes creep in as it ages. As I’ve mentioned, I’ve been trying to open to more of our higher end bottles lately, and I got the itch to open another bottle of Grenache. I have a few bottles of Priorat and Garnachas from other Spanish regions, but I still want to give them a little more time. On the other hand, I had a 2006 bottle from Clarendon Hills that was aching to be opened. I’ve had some really good experiences with New World versions with a little age on them–from good producers of course. For example, on my birthday last year we opened a bottle of 2007 Jaffurs Grenache. This is a favorite spot of ours in Santa Barbara and we always seem to like their Grenache. I was worried we’d perhaps let this bottle go little too long, but it turned out to be a beautiful spot! Here’s my instagram from that night. More #BirthdayTreats from yesterday. I really do love #cheese and #charcuterie, so I had more for dinner w a big serving of #Pâté and lots of veggies. Of course we opened up a special bottle. We picked up this #Grenache from @jaffurswinecellars on our trip to #SantaBarbara on our first anniversary. Despite the age, this bottle was showing really well. It was still really bright w layers of dark and red fruits, and just starting to show hints of dried prunes. I was slightly worried that I’d left it on the shelf too long, but I needn’t have – it still showed good acidity, structure, and a long finish. I was hoping to have a similar experience with this Clarendon Hills. . . We did! 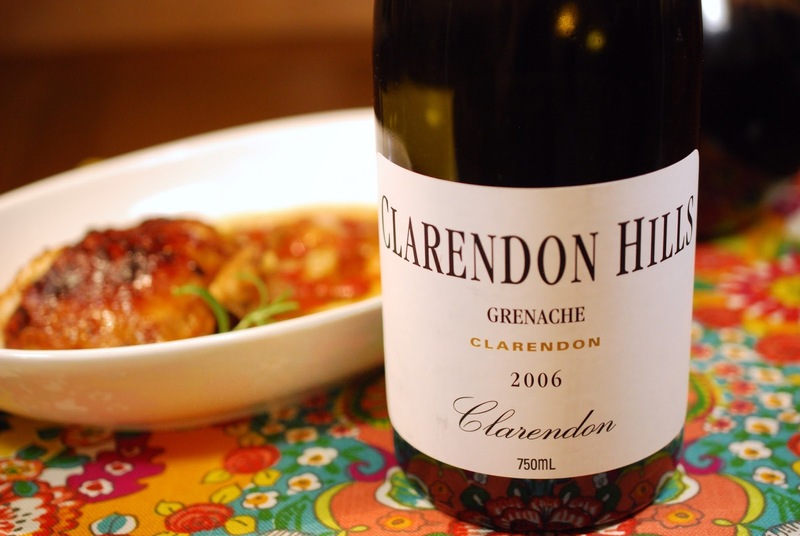 Today’s wine is the Clarendon Hills Grenache Clarendon 2006. The winery was founded by biochemist Roman Bratasiuk in 1990. His two sons Alex and Adam now work with him as well. Inspired by the world greatest wines, Roman decided to start making wine himself with aims of creating wines of similar greatness. He sought to make wines that convey their varietal expression but always with a sense of place. In Clarendon he found sizable parcels of 80-90 year old vine in varied terrains. 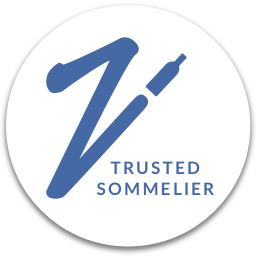 He has ‘Burgundian’ approach to winemaking, with 19 single vineyard wines available, complete with a cru hierarchy for his wines. Today’s wine would fit into the level comparable to the Village level. When Greg and I opened this wine we got notes of raspberry and strawberry leather, a little bit of eucalyptus and cedar, a little white pepper, and red flowers on the nose. On the palate, those berries were still there, but not as leathery. The fruit was still bright, and a little sauced. There was a hint of dried apricot as well. It still had that white pepper, along with warm spices. There was also a little tobacco and that woodsy note continued on the palate as well–Greg called it a “woodshop” note of sanded wood. Those herbal/woodsy notes both came out more and integrated with time, and it got rounder and more spicy with air. The tertiary notes were starting to show in a really attractive way, but it still had plenty of fruit. The wine has a ripe mouthfeel of medium to medium+ body–kind of right on the line between the two. The alcohol was definitely there, but it was wearing it well. The acid was medium, but still holding up. It had medium tannins that were soft and fine at this point. We both turned our thoughts to roasted birds for this. It also gave Greg thoughts of shakshuka/eggs in purgatory. I liked that idea, but tomatoes are pretty acidic on their own, so I usually would go for a more acidic wine to match that. In this case, I thought to mix them with eggplant, which is much lower in acidity. I brought thyme and rosemary, to play up that woodsy note, as well as clove and pepper to kick up the spices. We love chicken thighs, so I decide to roast some along with the vegetables and flavored them with a paste that also incorporated some of the flavor notes we got from the wine. I served all of that with cheesy polenta, for creamy richness. In the end, the vegetables came out saucier than I’d expected. This wasn’t really a problem at all–just saucier! In fact it was really freak’n tasty. The wine got fruitier alongside the food, and the rosemary really came out as well. All points resonated. Greg commented that it all matched remarkably well. Super yum. Taken from the winery’s tech sheet for the 2013 Cuvée. Region: Clarendon is a sub-district of McLaren Vale. (McClaren Vale is one Australia's most highly-regarded regions with a long winemaking history.) Located approximately 10 kms N/E of the McLaren Vale, the township of Clarendon straddles both the McLaren Vale region and also the Adelaide Hills wine region. The globally unique ancient geology found in the hillsides, coupled with its elevation of between 250-287 meters above sea level, creates an ideal and consistent macro-climate for growing and making fine wine. Winemaking: Low yielding, dry grown 90 y/o vines are hand picked and wild yeast fermented. All pressings returned to the barrel and bottled onsite without fining or filtration. Maturation: 18 months, within a hierarchy of 1-5 year old tightly grained French Oak. Barrels are finally hand selected by winemaking team. The SRP for this wine is $60 (although the average price on this vintage is currently $37 on Wine-Searcher.com), so it is a bit of a Splurge, but it was super tasty! 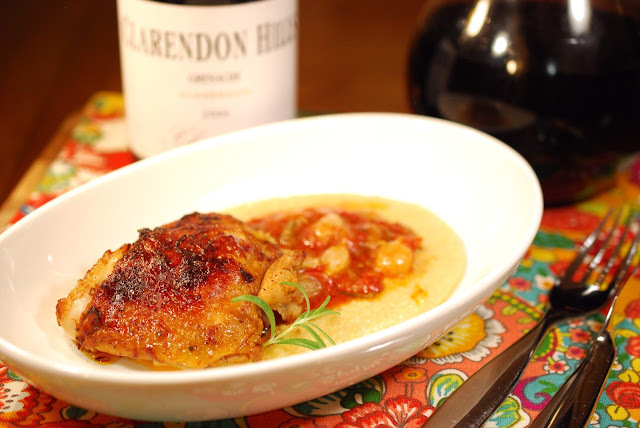 If you’re looking for another red to match this dish, look for something with a balance of fruits and herb notes. You’ll probably want to stay away from with wines with really grippy tannins. On the flip side, I think a fuller bodied white wine could slot in well too. 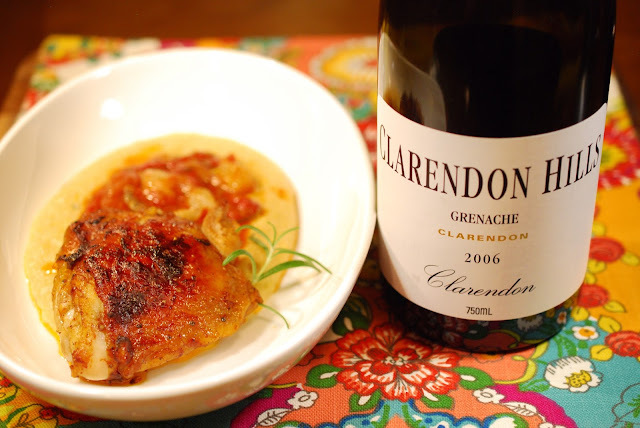 Since this Grenache has moderate tannins, I think it could work well with a range of poultry and meats, from chicken, duck, and turkey, to pork and lamb. Since it is also fruity, even with a bit a of age on it, I think this could also handle some light spice and hints of sweetness, maybe even BBQ as long as the sauce isn’t too sweet. As always, please leave a comment with any pairings that work for you! 2. Sprinkle the eggplant cubes with a generous sprinkling of salt. Set aside while you continue with the prep–about 15 minutes. 3. Combine the tomato paste, 1 Tbsp balsamic vinegar, ground clove, and a generous pinch of salt and pepper. Rub the paste onto each of the chicken thighs. Lightly grease a large oven-safe sauté pan or braising pan. Arrange the chicken thighs on the pan, making sure not to crowd the pan, then place the pan in the oven. Roast for about 15 minutes. 4. Moisture should have begun to bead on the eggplant. Pat dry with paper towels. Toss with the juice of ½ a lemon. 5. Remove the chicken from the oven and transfer to a plate. Deglaze the pan with an extra tablespoon or two of balsamic vinegar. (You could also use a splash of wine.) Add the eggplant cubes, pearled onions, picked thyme, and the rosemary to the pan, then arrange the chicken thighs on the vegetables. Put the chicken back in the oven and continue to cook for another 20 minutes or until chicken reaches an internal cooking temperature of 165°F. 6. Transfer the pan to the stove and remove the chicken from the pan and keep warm. Add tomatoes to the eggplant mixture and cook over medium-high heat. Make a slurry with the Wondra flour according to package instructions. Add the slurry to the pan and bring to a boil. Cook for 5 minutes until the mixture thickens into a saucy consistency. Remove the rosemary sprigs. Taste and adjust seasoning with additional salt, pepper, and ground clove as needed. 7. 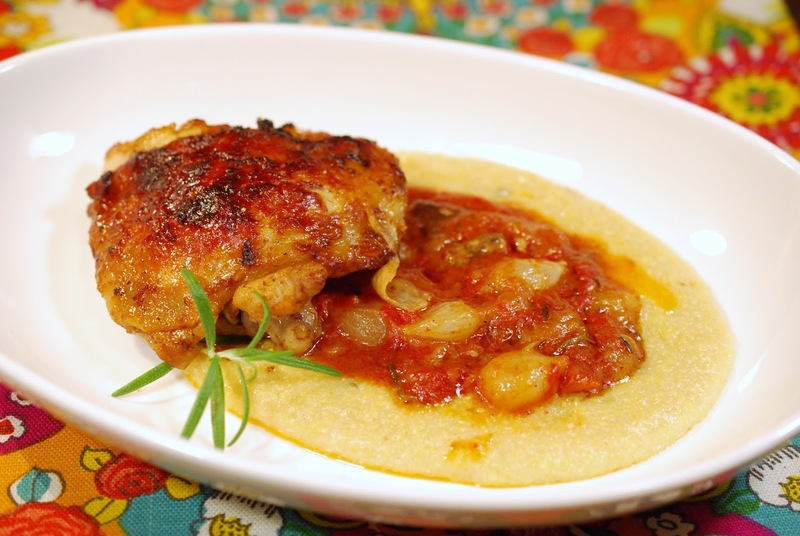 Serve the chicken with the saucy eggplant-tomato mixture on a scoop of polenta. 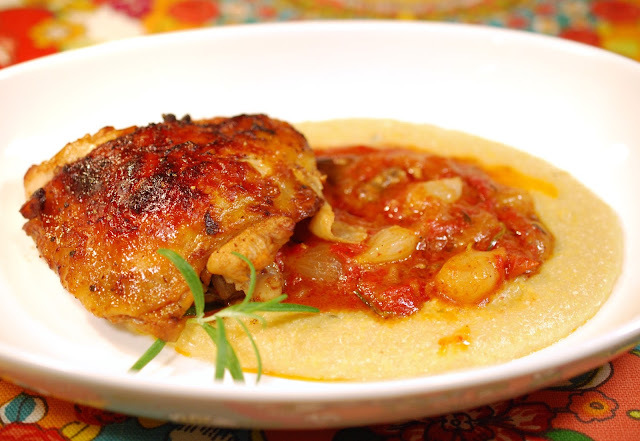 Prepare polenta while the chicken is cooking. If you start it simultaneously, they too should be done at about the same time. Prepare according to package instructions or use this great recipe for Creamy Polenta by Marcella Hazan. I often like to divide the water quantity with some stock. To make it extra decadent, stir in a little cream, goat cheese, Parmesan, or ricotta off-heat at the very end. I used ricotta this time. A little wine catch up from a tasting and exploration of #AustralianWine earlier this week. Such a great range of styles, from light, fresh and funky #naturalwines, to the richer styles they’re more typically known for, one with a little age and still showing well, and one #dessertwine for good measure.